The Speculative Sentiment Index (SSI) is one of the most powerful tools at a trader’s disposal. Now you can get the sentiment of your trading peers plotted right on your chart. Unlike major equities or futures markets, there is no single centralized exchange for forex trading. Such decentralized activity makes finding uniform open interest data impossible. FXCM as an industry-leading FX broker boasts important FX trading volumes and a significant trader sample. The SSI indicator makes that retail trader positioning data available to help fill this important gap in market information. 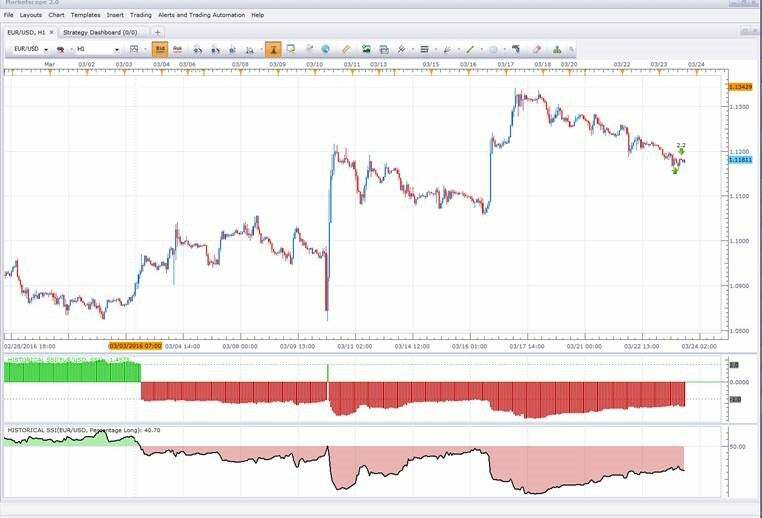 With the SSI indicator, you can plot real-time and SSI data on your chart, displaying the buyer-to-seller ratio among FXCM traders. At a glance, you can see where traders were in the market, updating each second. Are there large numbers of buyers or sellers? Are they exiting or entering? As a contrarian indicator, SSI helps you locate potential trading opportunities. This indicator also features a Percentage Long mode, which allows you to display a line graph for the percentage of current peer positions that are long. The SSI indicator is compatible with 18 symbols: GER30, US30, SPX500, UK100, FRA40, EUR/USD, GBP/USD, USD/JPY, USD/CAD, AUD/USD, NZD/USD, EUR/GBP, GBP/JPY, EUR/JPY, AUD/JPY, USD/CHF, XAU/USD and USOIL. Displayed Data? : Select SSI to view an SSI bar graph. Select Percentage Long to view a line graph with the percentage of current positions that are long.